Bees are flying insects are part of the insect order Hymenoptera. They are known for their role in pollination and producing honey and beeswax. They have complete metamorphosis. There are nearly 20,000 known species of bees and are found on every continent except Antarctica, in every habitat on the planet that contains insect-pollinated flowering plants. Adult bees are nectar feeders. Some adult bees paralyze insects or spiders as food. 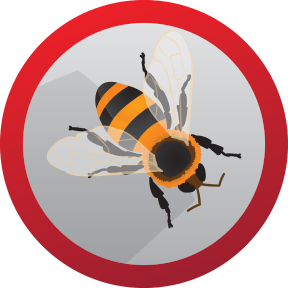 They are normally considered to be highly beneficial, however bees can be nuisances around buildings due to the fact that they forage for food among flowers and around outdoor dining areas. They can also become nuisances when they build their nests in wall voids, attics and other areas in or near buildings. Their nests can also be the source of carpet beetle infestations. Bees are infamous and feared because they defend themselves with a painful, venomous sting. The sting can cause varying amounts of swelling. Sensitive people are at most risk from these effects as bee venoms can evoke severe allergic reactions, known as anaphylaxis. An allergic individuals may become hypersensitive to the venom’s complex amino acids, proteins and enzymes. Occasionally, the reaction is can be so severe that a sensitized person may die shortly after a sting unless they receive medications to counteract the allergic effects. Bees have a long proboscis (a complex “tongue”) which enables them to obtain the nectar that is in flowers. They have antennae almost universally made up of 13 segments in males and 12 in females, as is typical for the superfamily. They all have two pairs of wings, the hind pair being the smaller of the two.